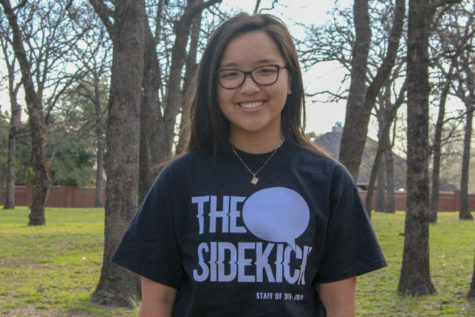 Coppell High School junior Nanette Pottoore experiences a deficit from her budget, forcing her to don paper clothes as an avenue to avoid paying more money for clothing. 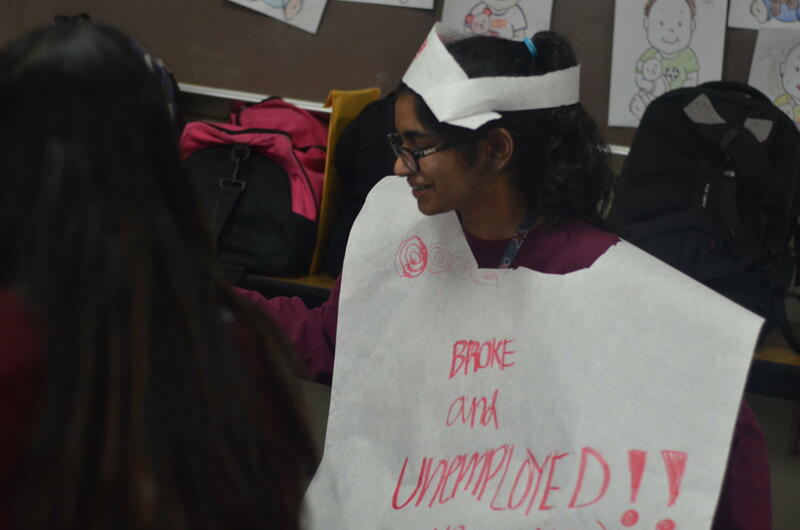 This week, the three AP U.S. History classes participated in an activity imitating the tragic conditions of the Great Depression, experiencing the simulated hardships for themselves. The threat of losing their entire livelihood constantly loomed over the heads of Americans during the 1930s, a time period accurately labeled as the Great Depression. Families lost their jobs, their cars, even the roof over their heads. And now, students at Coppell High School are experiencing it too. In AP U.S. History classes, students are simulating the conditions of the Great Depression. Getting into pairs of two, these makeshift families must purchase all of the essentials—such as clothing, food and mortgage — while supporting a “child”. Under a budget that only gets closer and closer to zero, students are forced to make tough decisions such as giving up their child for the orphanage or joining the military to attain more money. Students can invest money in a bank (that they ultimately lose due to the market crash), indulge in entertainment such as candy or “illegal hooch” (ginger ale and root beer) and lose their homes, which forces them to reside under their desks for the duration of the class, representing the historical Hooverville. For CHS junior Diya Patel, in an effort to gain more money, she and her “sister” had to give up their regular clothes for rags in the form of butcher paper. While these classroom situations may seem frivolous at first glance, simulating the tragic conditions of the Great Depression has only developed students’ appreciation and recognition of what American families went through during that time period. This type of activity is something new with students being fully immersed in the era of the Great Depression, creating another level in the depth of information learned. All three APUSH teachers—Kevin Casey, Diane de Waal and Scott Shelby—are participating in this activity. This new approach to teaching is a purposeful effort on their parts to engage their students in learning and retaining the unit’s information. From paying their phone and electric bills to wearing paper clothes, students in APUSH are almost able to experience history first hand right inside their classrooms.